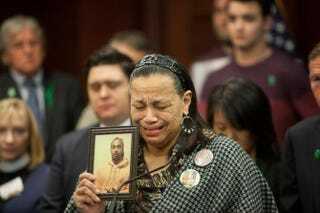 Miyoshia Bailey cries as she describes how her only son, Cortez Bailey, 23, was shot to death in Chicago during a press conference featuring supporters of gun control and family members of gun-violence victims on Capitol Hill in Washington, D.C., on Dec. 10, 2015. Four in 10 African Americans have been personally impacted by gun-related violence and believe "there is a perception that the rest of the country doesn’t care about it." That’s what was written in a new study on gun violence being released Thursday. A comprehensive study, "Engaging Communities in Reducing Gun Violence: A Road Map for Safer Communities," will be released by the Joint Center for Political and Economic Studies, the Urban Institute and the Joyce Foundation. The comprehensive joint effort is an attempt to bring together communities, policymakers, scholars and other stakeholders to focus on strategies and solutions to confront gun violence. The debate around the issue is at times misdirected toward more sensational gun crimes rather than on efforts to listen to the people in communities disproportionately affected by the problem. The Benenson Strategy Group conducted a total of 1,200 interviews by phone, dividing them between 600 African Americans and 600 Hispanics across the U.S., from Feb. 22-28, 2016. It's particularly noteworthy that all respondents were registered voters likely to cast a ballot in the 2016 presidential election Nov. 8. The focus of the effort around the study was to give those who are affected by gun violence an opportunity to connect with policymakers and to give continued attention to day-in-and-day-out gun violence that has a far-reaching impact. Media attention often focuses on mass shootings when statistics show that day-to-day violence has much more impact. The report focuses on African Americans, who account for over 50 percent of the victims of gun homicide. It also points out that gun violence is the second-leading cause of death for Latino males between ages 15 and 34. Not surprisingly, given what has been uncovered regarding stop-and-frisk data in large metropolitan cities, the polling data revealed that "more than half of African Americans and 1 in 3 Hispanics have had a negative interaction with law enforcement." The poll also revealed concerns related to interactions with police. From the study: "There is a particularly strong concern around interactions between the police and young men of color; 82 percent of African Americans and 65 percent of Hispanics agree that they 'frequently worry about interactions between the police and young men of color.' "
The report also found "that 8 in 10 African Americans and 2 in 3 Hispanics frequently worry about interactions between police and young men of color, even though most believe police make their communities safer." The Joint Center, led by George Washington University Law Professor Spencer Overton, convened more than 100 community members—including clergy, police, the formally incarcerated and elected officials—in meetings on the issue of gun violence. Those sessions included stops in Richmond, Va., as well as Milwaukee and Stockton, Calif.
Overton, Joel Benenson of the Benenson Strategy Group, pollster Ron Lester of Lester and Associates, Sarah Rosen Wartell of the Urban Institute and Ellen Alberding of the Joyce Foundation will announce the study at the National Press Club in Washington, D.C., on Thursday.